For Halloween this year, we wanted to do something special for University City library teens since CMS was out of school, and Halloween was on a weekday. Both of us have been interested and participated in escape rooms around Charlotte, and thought we could easily bring it to our library. First we did a little bit of research, and used our personal experiences to come up with ideas about how this could work at our branch. The article that really got us motivated was from American Library Magazine. Next, we had to come up with a theme. This was easy, and we decided on a haunted library and we would use the UC storytime room. You have suddenly woken up, alone in the darkened library. What happened? To your dismay, the library is closed and you found yourself locked in for the night. Then, you remember, this is the library that was haunted by a teen who had accidently passed away when a bookshelf collapsed on her. The ghost, Lonely Lesley, is said to be wandering the stacks, looking for her friends who didn’t help her. You don’t know when she’ll come, or if she is nice or evil. Do you really want to find out? No! Work as a team to escape the library before Lonely Lesley gets you! Next, was coming up with the clues, and we needed to keep them age appropriate. Our goal was to have the majority of teens able to escape the room. We decided on three clues. Clue one was easily labeled on the flannel board; it came with instructions. 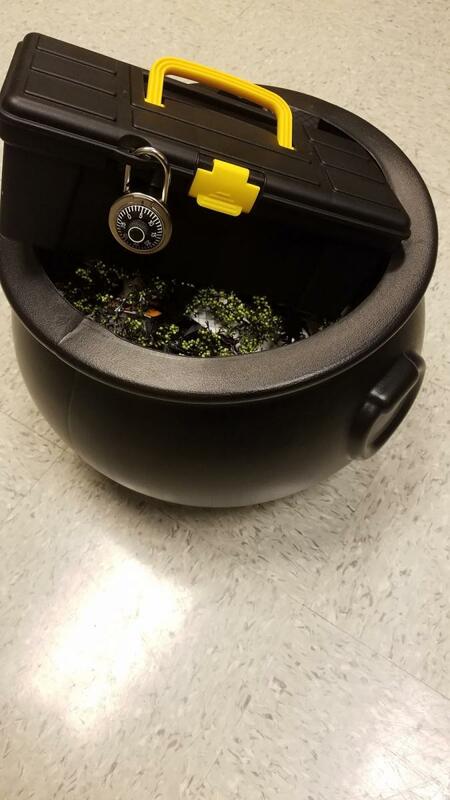 Teens would also see a cauldron with a box held shut by a combination lock. Clue one was about answering a question and counting certain things in the room; these three answers would give them the combination to the lock. We put the clues in order, so they would put them in correct order on the lock. Once they opened the box with the combination, teens found certain objects in the box that was clue two. The box contained a crumpled up paper with a book title, a lanyard with a bunch of color coded keys, watercolor paints, a jar of water, and brushes. Teens would take the book title to the storytime room bookshelf, and find a match. Once found, pieces of paper to clue three were obtained. In the locked box from clue two, teens would see a sign that said “The watercolors are your key.” This would signal them to use the watercolor paints to find the message on the pieces of paper. Once painted, the pieces of paper would show letters; this was clue three. Teens needed to unscramble the letters, and it would spell a color that would match the colors on the cabinets in the storytime room. This color would also match a key from the lanyard that was inside the box. Once they put those together, it would unlock the cabinet that told them to write down their favorite scary movie, and slip it under the door to escape. After all the planning, we were ready to purchase supplies and program. We also decided to have a witch hat making activity for teens as they waited. This was easy to set up because the UC Partners group had donated us a vast amount of witch hats. Teens also needed to register for the program because we had limited time, and wanted to prepare for a certain amount of teens. I would recommend this to other branches/libraries because you have to work with such a strict timeline for the program. Next, came holding the program for teen customers. When the first group of teens were ready we shared the story introduction and we went over the rules. We decided it would work best for our timeline if each group of teens, 2 - 3 at a time, would get 15 minutes to escape. The time would be displayed on our new Aquos board, so it was easily visible. We also had timers on our phone to keep track, since we were not to be in the room with the teens. Each group also gets three hints. To hear a hint, teens simple needed to knock loudly on the door. Once their hints were all used, they get no more. And, we couldn’t forget the spooky, scary music! Of all the groups, they all needed hints, but none of the groups used all three. When we do another escape room program, we will give teens more time as well, more clues, and we will use the community room, as it is larger. Groups of three seemed to work best as well; it also allowed teens to meet new teens from the community. We also recommend making a large display showing information about the room because teens and parents will surely notice it. It is important to include information about registration, but also what age the program is geared for because we did have some younger children asking about it. Lastly, don’t forget to cover any windows, so that other teens can’t see into the room; this would ruin the game. The program was a great way for teens to utilize critical thinking, and puzzle solving skills. It was very successful, and is great to have when students are out of school. The program could be held longer during the afternoon, and more teens could participate. Check back later in November for our spy themed escape room!